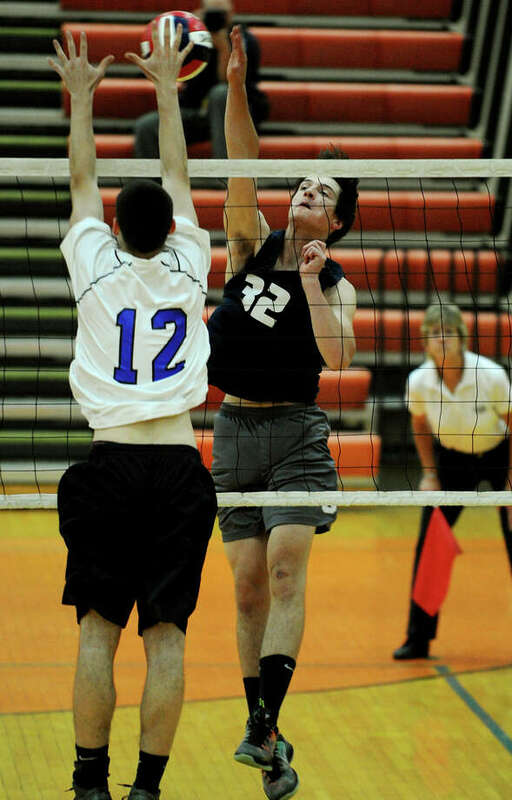 SHELTON -- There were times this season when it looked like the Staples boys volleyball team might never lose, whether it was the ease with which it dispatched rival Ridgefield in the FCIAC championship game or the dominance it displayed while winning 18 straight matches. That only makes what happened at the Shelton High School gymnasium Monday night even more puzzling. The second-seeded Wreckers looked nothing like the powerhouse program which has appeared in 11 state championship games since 2001, including last year's title game against Glastonbury. Instead, it was No. 3 Southington which played the part of the bully, controlling the match from the opening serve to the final spike, rolling to a surprising 3-0 victory in the Class L semifinals. The Knights (18-2), who will face No. 1 Ridgefield (19-1) in the Class L championship Thursday night at Kennedy, won by scores of 25-19, 25-16 and 25-19. Staples (18-2) lost for the first time since falling to Ridgefield in the seasonopener. "Something was missing tonight," said Staples head coach John Shepro, who believes this is the first 3-0 loss in program history. "I don't know what was going on, but we didn't look like Staples volleyball tonight. They picked up a lot of our hits and got us frustrated early. We just couldn't get our offense going. Nothing was working tonight." Southington has had a tough history against Staples, falling to the Wreckers in the state playoffs five times over a six-year span from 2007-2012. This time, the Knights turned the tables with smart passing from senior Peter Masters and strong play at the net by senior outside hitter Dan Shaughnessy, who finished with 13 kills and three blocks. "That was definitely on our minds," Shaughnessy said. "We talked about it in the huddle in the third set. Not many Southington teams have had a chance to beat them, so it's nice to get one against them." Southington won with its defense, using three players on the outside instead of the typical two, and a game plan that kept the ball away from Lucas Grevers (10 kills) and Ian Grimes (seven kills), the two top hitters for Staples. "We talked about it all night that defense was going to win this game," Shaughnessy said. "We never let the ball hit the floor." Staples led the third set 8-2 but Southington scored 10 straight points to take a 12-8 lead and never trailed after that. "We got down and just couldn't get the momentum back," Shepro said. "Southington just kept coming at us."